In a medium bowl, combine raisins and dried tomatoes. Cover with about 2 cups of warm water and let soak for 10 minutes. Drain and set raisins/tomatoes aside. Meanwhile in a large pan or pot over low heat, lay half the greens. Then distribute the raisins, tomatoes, olives, parsley, onions and garlic over top. Put the remaining greens over, and add the red wine, salt, pepper and pepper flakes. Then lay a piece of parchment paper cut to fit the shape of the pan/pot over the whole thing, and tuck the sides in tightly. Cover and cook 25 minutes until greens are tender. 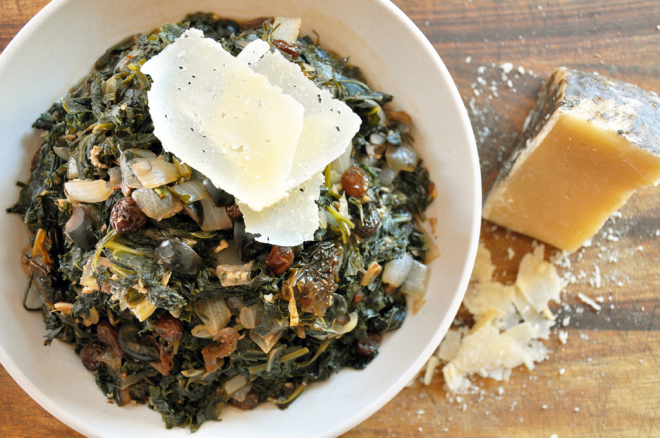 You may need to cook them up to 40 minutes for thicker leaves like collards and kale. Remove from heat, drain in a colander and serve in a large bowl with shaved Manchego.